If you’re looking for a frugal, healthy recipe for dinner tonight, then have I got a treat for you. 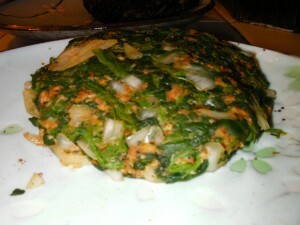 Spinach burgers. A and I made these the other night and they came out deliciously good. And the best part? They cost almost nothing to make, and they’re really, really healthy. These ingredients are for 4 regular sized patties. Defrost spinach, and then squeeze all the water out by hand. The drier the spinach is, the better your burgers will stick together. While the spinach is defrosting, heat up the oven to 400 degrees. Rip up your bread into tiny pieces, spreading them on a cookie sheet in one layer. I kept my breadcrumbs in the oven for 5-6 minutes, and they were fine. If you have bagged breadcrumbs, of course, you can skip this step. After the spinach is pressed dry and the breadcrumbs are toasted, dump everything on the ingredient list into a large mixing bowl and blend by hand. Spray a non stick skillet pan with cooking spray and cook on medium/high heat until the burgers are heated through and crusty on the outside. It’s also tasty to caramelize some onions after this to put on the burgers! Enjoy with all your favorite burger fixings! We LOVED how these came out! A found a basic recipe online, but we added much more spice than it called for. If you don’t want spicy burgers you could easily leave out the red pepper and paprika. Like I said, the original recipe didn’t call for that anyway. We also forgot the eggs when we made ours. They were still delicious, but I think they would have held together much better with the eggs. So, that’s an important addition! How much did we spend? Well, we got an amazing deal on frozen spinach at Aldi (55 cents for a 16 oz. bag: we stocked up!). With everything, I’d be willing to bet that we didn’t spend more than $2 on the whole meal. And as you can see from the directions, they were super easy to make. Toast some potatoes in the oven with some sea salt and olive oil and you’ve got a fantastic, frugal, healthy dinner in a flash. Yum! Good luck, and if you make them please let me know how they turned out! My husband likes it when I make spinach burgers with turkey meat since he doesn’t eat strict vegetarian. Also, you can mash some pinto beans; add some eggs, then add the spinach and they’ll hold together better as well as add protein. 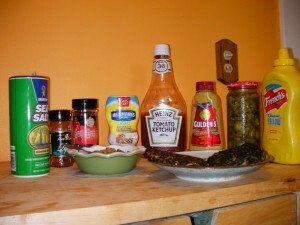 I also like making a spinach meat-loaf; gets extra iron into your diet, and a great flavor. We tried this tonight. Wonderful! We did add a slice of Jack cheese and covered for a couple of minutes to let it melt before serving. Next time we’ll try it wit crumbled feta or blue cheese. @Diane- That’s a great idea to mash up some beans in there, thanks! I might try that next time. @Wil- I’m so glad you gave it a go! I completely forgot to mention feta; we added some to our burgers after they were done. But Pepperjack cheese sounds yum! We have some sharp white cheddar with habanero peppers mixed in we buy from a local farmer and I’m definitely trying that next time. YUM! I stumbled across your website last night at about 10 pm…and didn’t go to sleep until 3 am.. Needless to say I am in LOVE with your website. I made a couple of tweaks however that I think you’ll enjoy! My friend’s tease me for my love of fiber but I really find Fiberone Original cereal thrown into the magic bullet with some garlic, parsley, pepper, and salt serves as an amazing and nourishing bread crumb substitute. I also tested out the bean idea and added some pureed black beans with cumin and thyme in addition to sauteed mushrooms and garlic.I don’t have wheat germ, but I can’t wait to try it with!. Thank you so much! As a college student, cheap, healthy, and easy aren’t adjectives I get to use in combination too often! Thanks so much! I’m so happy you found the blog, and found some useful information. You’re also my new best friend: I’m in LOVE with Fiber One (Raison Bran Clusters for me). I truly think that eating a high-fiber diet is one of the best things you can do to stay healthy. I never thought of using the original cereal in cooking however, but that’s an awesome idea! 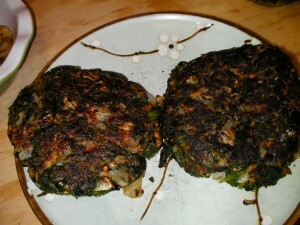 One blog I super love for cheap, healthy recipes is Cheap Healthy Good http://cheaphealthygood.blogspot.com/. I added tofu, and used brown rice instead of quinoa (you can see my comment on other changes I made to the recipe about halfway down the comment section). It turned out super tasty, and was really cheap to make. Good luck, and thanks so much for reading!